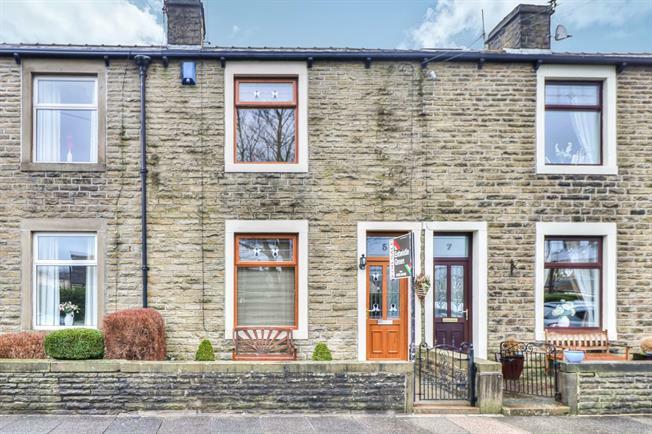 2 Bedroom Terraced House For Sale in Colne for Offers in the region of £110,000. A superb two bedroom two reception room property immaculate presented throughout with modern kitchen a recently installed bathroom suite, the accommodation on offer briefly comprises; hall, good size lounge and dining room, quality modern kitchen, two well proportioned bedrooms and superb family bathroom. Externally is a neat paved garden area to the front and enclosed paved yard to the rear of the property with outbuilding/utility room. Double glazed window. Radiator and gas fire, wall lights and ceiling light. Double glazed bay window. Radiator and plinth heater, recessed lighting, feature light and ceiling light. Wall and base units, inset sink, integrated electric oven, integrated microwave oven, integrated, gas hob, overhead extractor, integrated fridge/freezer. Double glazed window. Radiator, fitted wardrobes and built-in storage cupboard, wall lights and ceiling light. Double glazed window. Radiator, ceiling light. Low level WC, double enclosure shower, wash hand basin.